We’re excited and proud to share our exchange token, DRIVE Coin (DRV), with the world! DRV will open for trading on April 3rd, 2019 at 1PM UTC and will be priced at $0.14. DRV, as with exchange tokens like BNB, offers trading fee rebates and discounted listing for issuers. At the time of writing, BNB was trading at $16.51. There will be 70M DRV available to trade on the first day of listing which represents 18% of total supply. The remainder of DRV is locked up across a 24 month release schedule. Like Binance, DRIVE Markets is committed to a buyback of DRV which will see 20% of net profits, each quarter, used to buy back DRV and reduce total supply to 250M. So what makes DRIVE Markets and DRV special? 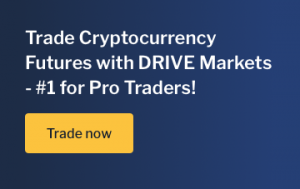 DRIVE Markets is a high frequency, crypto and fiat currency exchange, offering futures and spot trading for Bitcoin, Litecoin, Bitcoin Cash, Ripple and Ethereum. Our goal is to bring forex traders to the crypto markets by providing the speed, reliability and liquidity they are used to. We’ve teamed up with forex giants including KX and MetaTrader to entice forex traders to crypto. The forex market, which trades up to $5trillion daily is frequently compared to crypto but forex traders have been sidelined from crypto due to a lack of high frequency trading and deep liquidity — something that DRIVE provides. This means DRV is one of the first cryptocurrencies to be available for high frequency trading and we’re pretty excited about bringing that to crypto. Registration is open on Drive Markets and users can sign up and prepare for the first day of trading of DRV. There are no minimum order sizes and with a robust, institutional grade platform, we should see an IEO with a bit more of a level playing field vs other platforms. In short, almost everyone should have an opportunity to pick up DRV on the first day of listing. For more information, visit https://drivemarkets.com and follow @DRIVEmarkets on Twitter and Telegram. For the latest industry insights and news, checkout https://driveinsider.com.